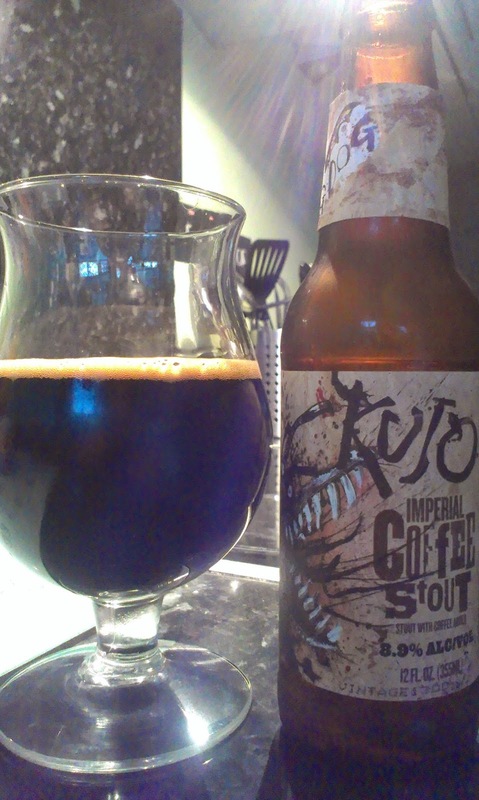 It's weird, I'm not one for coffee (or tea for that matter) yet I seem to really enjoy coffee porters and stouts. Maybe its just that hot drinks do nothing for me... anyway, here's three recent variations on coffee porters I've had - even better two of them are ticks from the list! Description: Poured a decent oily black with a tan head. Lots of coffee and bitter cocoa in the aroma, and some nice roasted malt in the background. Less coffee in the taste than you'd expect from the smell, more light frappuccino than espresso here, decent chocolate hint too. Some light roasted malt as a backbone. Dryish, with a mid to full body and a little bitterness on the finish. Description: Poured a deep black colour with brown head that didn't last very long. Roasted malt on the nose, bitter coffee, but there's a definite aroma of hops here too. Taste starts off all bitter coffee and toasted malt, but then the hops come through providing a can of floral bitterness at the end. Thick, resin like, but quite carbonated with it. Hides the ABV well. Thoughts: I think expectations got to me here. I was waiting to be wowed and it never happened. I personally thought it was too hoppy to really go with the coffee and oatmeal base. Not sure I'd buy again to be honest. But feel free to tell me I'm wrong (and why) in the comments! Description: Dark with a tan head that disappeared really quickly. Lots of coffee on the nose and a big aroma of toasted malt. Taste eases back on the coffee (just a wee bit), there's some sweetness in here too, with a hint of wood and smoke. I also got a twang of apple (but that might just be me). Effervescent, yet creamy and smooth. Slightly oily and full bodied. Thoughts:I genuinely thought this would be way too much coffee for me; I was wrong - this was lovely. Though I could taste every % of the ABV - but in a good way - brings heat to what is a big, but quite well balanced, imperial stout. Go buy some! I missed Beerclubbelfast's much anticipated beer and cheese night - looks like it was a cracker. Anyone who was there fill me in? Best beer, best cheese, best pairing?